Peter’s Pressure Washing provides safest roof cleaning services in Tampa Bay, Florida. You must know that traditional pressure washing is not always a solution if algae, mildew, or mold take a toll on your roof. Sometimes, a roof may need a simple soft wash that removes mildew or algae without damaging shingles or tiles. Call our experts for professional roof cleaning solutions using soft washing techniques. Black Algae growing on your home’s roof is an unsightly blemish that can reduce the beauty of your home and make your roof look worn out. Fortunately, there is a safe treatment available that will both effectively remove the algae and make your roof look new again. This treatment does not involve pressure washing or aggressive cleaning of any kind. 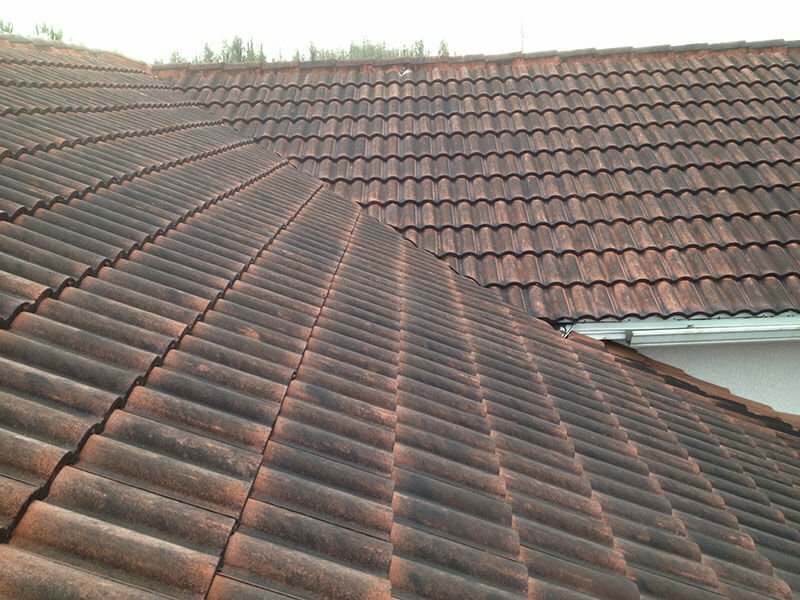 Here at our pressure washing company, we possess the equipment and training to perform this safe roof cleaning treatment on both tile roofs and shingle roofs. We also carry the proper Worker’s Compensation Insurance required for roof cleaning, which sets us apart from many other companies. Some additional benefits of cleaning your roof are extended shingle life, decreased cooling effort on your AC which saves on electricity, and decreased granule loss. Call us now to request a free roof cleaning estimate or click the button below! Why Does My Roof Appear to Look Black? If your rooftop appears black or dark streaked, it’s more than likely roof algae, lichens or moss feeding off it. This black algae, also known as Gloeocapsa Magma, thrives in warm and humid climates of Florida and generally grows on the north side of your rooftop. The longer the algae goes untreated the more it weakens your rooftop. With time it diminishes your roof’s ability to reflect heat rays, weakens the wood, reduces curb appeal, and increases your home cooling expenses. Pressure washing your roof just because your neighbor did it may sound tempting but stop right there. The damage caused by pressure washing may not be immediately prevalent as it wipes out the granules from the asphalt shingles – and that is what keeps your roof protected from outside elements like rain, wind, and sun. In weakened roofs, you will notice water starting to seep inside the edges of joining tiles into the underlayment section. Also, many tiles end up cracked or need repair or replacement. The force and water volume strips away your rooftops lifespan making it an expensive proposition. Good staff and fair pricing. Took time to explain the job and their process. Very happy with the results. Had a small issue that they immediately thanked me for providing feedback and insisted on fully correcting it to make it right. Not often I have encountered this customer service attitude. Well done! Fortunately, there is a safe treatment available that will both effectively remove the algae and make your roof look new again. This treatment does not involve pressure washing or aggressive cleaning with lethal chemicals such as chlorine bleach, or phosphates that also pollute waterways and damage vegetation. At Peter’s Pressure Washing our specialists use environmental-friendly roof cleaning products and equipment aimed to give your rooftop a gentle, thorough, and safe roof cleaning. Our low-pressure rinsing system removes algae, lichens, and moss on both, asphalt and shingle roofs. What sets our power washing services apart is that we own a valid Worker’s Compensation Insurance to perform your roof cleaning treatment. Your roof lasts a whole lot longer and helps reduce your electricity bill. Besides, our cleaning agents do not damage any vulnerable areas of vegetation around your houses like grass, flowers, and bushes. We completely rinse off the roof area leaving it clean. Look at the reviews from our many satisfied customers or call us now to request a free roof cleaning estimate or click the button below! My roof has a steep pitch and can't be walked on, do you do roof cleaning for steep pitch roofs? Yes, we are able to clean most 1 story steep roofs from the ground using a long range nozzle. For two story steep roofs we can spray from ladder placement. How often do I need to clean my roof? There are some variables involved, but in general every 3-5 years. What precautions do you take to protect my landscaping? Cover with tarps (where possible). With these precautions in place, the majority of the time we have either no damage/minor damage. Will I have to wait to see the difference after the job is done? No! 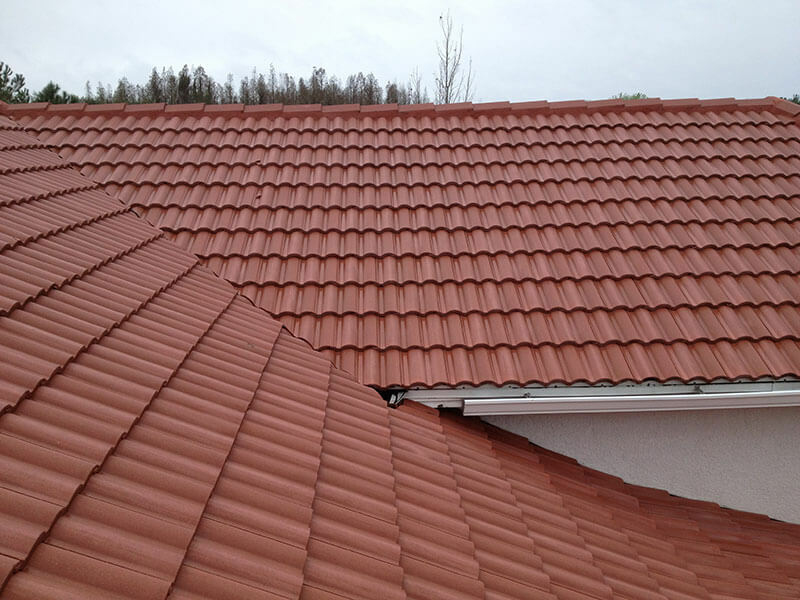 In fact, by the time we are done with the job your roof will already look new again. What exactly is the black growth/streaks on my roof? The black growth you see on the roof algae. Technically it is called Gleocapsa Magma. In Addition, you may have some various forms of mold, lichen, and moss, which are all treatable with the same chemical cleaning process. What areas do you service for roof cleaning? We perform safe non-pressure roof cleaning in Tampa, Wesley Chapel, New Tampa, Zephyrhills, Riverview, Apollo Beach, Ruskin, Gibsonton, Sun City, Wimauma, Seffner, Valrico, Dover, Brandon, Lithia, Plant City, Temple Terrace, South Tampa, and New Tampa.